The quest for freedom by the Indigenous People of Biafra(IPOB) is not a taboo neither is it the first of its kind. It is never illegal in the world rather, a prerogative and inalienable rights of people around the world. South Africa, India, Ghana and Cameroon to mention but a few, all had their independence which was respectively led by Nelson Mandela, Mahatma Gandhi, Dr. Nkwame Nkrumah and Reuben Um Nyobe. Why then must the Nigerian government which the world leaders expect to be well acquainted with freedom as a fundamental right of any citizen, disgrace themselves by tagging the Biafra restoration movement championed by IPOB, an act of terrorism? This can only be obtainable when a president that is engulfed, bedevilled and driven by hatred over a particular race is in power. Little wonder Buhari the president behind this proscription saga was captured in a video in his U.S visit saying that "constituencies that gave him 97% cannot in all honesty be treated equally, on some issues, with constituencies that gave him 5%." The world is aware of what happened on 30th of May, 2017 where the leader of the Indigenous People of Biafra, Mazi Nnamdi Kanu directed his people to observe a Sit-At-Home in commemoration of their fallen heroes and heroines who lost their precious lives during the genocidal war unleashed on the people of Biafra. The Biafran people fully complied and the whole area was left in comatose. For a seating president to sign a proclamation proscribing an indigenous people like the Biafrans, is an exhibition of racism and the world leaders need to get him keelhauled in order to promote justice in the world. I believe that equity and justice are the most vital determinants of peace and should be seen as a priority to the world leaders in this holy and peaceful quest for the restoration of the sovereign state of Biafra. A clear indication I want the whole world to diagnose here is that the Biafrans have a pedigree, going back to the defunct Eastern region in the unholy amalgamation of Nigeria. The Biafra restoration movement spearheaded by Mazi Nnamdi Kanu is not errant as Nigeria and her military is fighting tooth and nail to make the world believe. That is why in their idiosyncrasy, eccentricity and antics, they have devised and perfected various strategies to blackmail and block the actualisation of this struggle for freedom. So to actualize their unholy and unscrupulous mission, they conglomerated on 15th of September, 2017 to issue a press release tagging Biafran people "a militant terrorist race". To the people around the world, if a race like the Biafrans should be declared as terrorists for merely asking for referendum, I think Britain should also be called the Terrorist State of Britain(TSB) because there is no difference between a referendum vote for Brexit and a proposed referendum vote for Biafrexit. On the other hand, the Nigerian government under President Buhari, by declaring Biafrans terrorists, is trying to justify the killing of Biafrans by her military and to exonerate themselves from the recorded violation of human rights and abuses. This is also an attempt to ensure that Biafrans are chased back to their shells over restoring their father land. But this is quite impossible and irrevocable. Therefore, I find it wise to make the world understand that IPOB is neither a group nor an organization but a people with a pedigree. We are fighting for our freedom with the weapon of truth. The same IPOB here in Biafra land is the same IPOB in Diaspora. We remain peaceful and unarmed in our pursuit for self-defense-determination. The Nigerian military has slaughtered us in numbers just to subdue us into surrendering this struggle for total freedom. They have orchestrated many terrorist attacks in our land under the guise of one operation or the other. The latest is the infamous ‘‘Operation Python Dance ll’’ by the military whose ammunitions are supplied by the United States of America, staged this brutal operation in violation of human rights in the most peaceful part of the world(Biafra land). The 14th day of September, 2017 was a bloody day in Biafra land as the military invaded the residence of the leader of the Biafran people, Mazi Nnamdi Kanu, killing armless Biafrans in his compound and shooting sporadically into his private room in an attempt to eliminate the freedom fighter. Racism should not be given a feathered-bed to thrive around the world as it could trigger another world war. And for a president whose country is a member of the United Nations to be a number one racist in the country, is very unacceptable. Let UN not harbour criminals in the form of creating a strong alliance in the world. 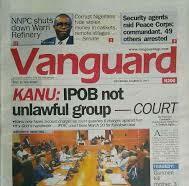 This time, there is need to look into the Biafra sovereignty issue and do justice to it. Imagine UN having a nation like Biafra in their midst, I think the world will advance a new level that will profit humanity.